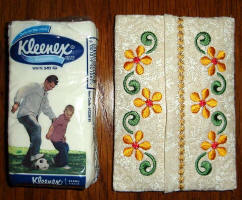 The Tissue holder fits the "Kleenex Facial Tissues Pack", perfectly. The entire tissue holder is completely made in the hoop, in 1 hooping. Steps for sewing the sides together is built into the design. However, if you prefer to sew the sides together on your sewing machine, then by all means you can do that too.